Having the ability to cook your food if you’re forced to travel off-grid or if the grid itself (electricity, gas etc) goes down should be an essential part of your preparations. In this two-part article, I’ll be discussing both portable and fixed off-grid survival cooking options, their pros and cons, and hopefully be able to leave you with a better idea of what would be best for your situation. An integral part of every preppers bug-out bag (or 3rd tier survival kit) is the ability to cook while on the go. Of course building a campfire is a definite option (since you should have fire making implements with you in your kit anyways) but as I’ve stressed before, redundancy is key and having another way to cook food is ideal. This is where a small portable camp stove comes in handy. So when, besides camping, would you ever need this type of stove? Well, many different scenarios come to mind, but they all involve one basic condition — you’re away from your home base and do not have access to your fixed-stove options. This could be a forced retreat of your home due to a natural disaster or civil unrest. It may also be as simple as being stranded in your car for a few days until help arrives. Either way, having the option to cook food while on the go or if stranded miles away from home should be on every preppers priority list. 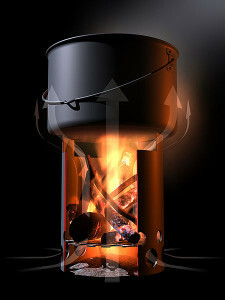 The three main types of portable stoves are gas/liquid fuel stoves, solid fuel stoves, and wood burning stoves. Even though wood is a solid fuel, for ease of discussion I’ll put it in its own category. While there are many different types of gas/liquid fuel stoves available on the market, the ones I would recommend are the variety that are compact and can burn multiple types of fuel. 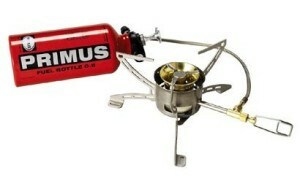 The stove that I love is the Primus Omni-Fuel (The MSR Dragonfly is also a good option). Not only does it run on standard disposable LP (liquified petroleum -> aka propane) gas cartridges that you’ll find at most camping/outdoor stores, but if you use the optional fuel bottle it can run on almost any other type of fuel: aviation fuel, white gas, normal unleaded gasoline, diesel, alchohol, and kerosene. This is a definite bonus since disposable LP cartridges aren’t as easy to come by when on the go like the other options. The benefits to this type of stove is the ease of use, adjustable heat, lightweight design, ability to function in extreme environments, and multitude of available fuels. Keep in mind, while the stove itself is light, the additional fuel canisters you may want to pack can add up and take up space. Since there are moving parts, they can also get damaged out in the field. And worst of all, when your fuel supply does run out, that $150 stove of yours is about as useful as a poke in the eye. For this reason it’s not the best long-term solution, but for bugging out a short time it’s great. Similar to gas/liquid fuel stoves, solid fuel stoves come in many different varieties. 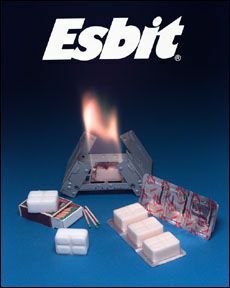 The two most common are the alcohol gel (Sterno) stove and the hexamine tablet types (ESBIT stove). The great benefit of these types of stoves is that the fuel and stove are both very lightweight and cheap. They’re also easy to pack in that they hardly take up any space and since there are no moving parts, they can take a beating and still function. The downsides are that the heat output is difficult to regulate and they don’t burn as hot as gas/liquid type stoves. Also similar to the gas/liquid stoves when the fuel is out that’s it, hexamine tablets are pretty hard to come by in nature. Portable wood-burning hiking stoves may be the oldest form of portable cooking stove around. And just like gas, liquid, and solid fuel stoves wood burning hiking stoves come in many different varieties — from the simplest hobo stoves to the more cutting-edge Kelly Kettle. Homemade portable wood stoves — most often referred to as “hobo stoves” — have been commonplace cooking devices for hobos, homeless, and backpackers for years. They are easily fashioned from old tin cans and are surprisingly quite effective for cooking and heating. There are a great number of sites online with various versions of the basic hobo stove that you can learn from. There are obvious benefits to this type of stove. One of the main ones being that the fuel is free and (depending on the area) widely available. Also, the homemade varieties range from costing nothing to under $10. The flip side to wood burning stoves is the more skill required to light it. This is especially apparent during wet weather. If you find lighting campfires difficult under optimal conditions, you may want to stay away from these types of stoves until your skill level improves. Keep in mind however that most wood stoves can double as Esbit-type stoves. Taking along some extra Esbit tablets as backup is always a good idea under any conditions. Thanks for the link. I like the compactness of that stove. It would be an easy fit in any backpack. The stove I’ve carried since ’72 is the Phoebus, a Swiss made backpack stove that runs on liquid gas, kerosene, parafin (melted), or, in a real pinch, alcohol. Not lightweight in the least, it’ll heat a quart of water in a couple minutes at zero degrees, has two moving parts easily replaceable and comes with its own carrying tin. Next best, IMO- and when I was first shopping for them- is the Svea 123, which is a bit more light-weight, and the reason I rejected it. In my mind, the best aspect of these two stoves is their ability to burn almost anything you can trap, really do last ‘forever’, and burn hot. One gallon of gasoline will last longer than ten bottles of LP, weigh less and can be reused as the container for more siphoned/purchased fuel. Laughed at by many “pro’s” is the Coleman dual-fuel stove- mostly due to its weight- but here agian is a camp stove worth considering, IMO. Not to knock the ‘cleanliness’ and efficiency of ‘modern’ stoves, but one wouldn’t go wrong testing or examining a few of the ‘older’ technologies. Thanks for the tip on the older stoves. Absolutely, if you find something that works for you by all means use it. My main concerns are ease of carry (lightweight) and durability. Many of the old-time stoves more than make up the excess weight in terms of them being built like tanks. That’s something to consider. I am not sure whether or not this post is written through him as nobody else understand such particular approximately my difficulty.